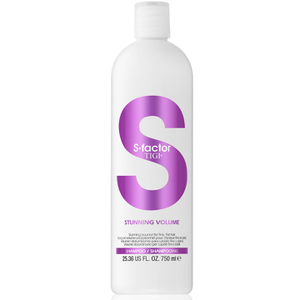 Transform lack-lustre locks with the TIGI S-Factor Stunning Volume Shampoo; a body-boosting formula that works to add bounce to fine, flat hair. Infused with a moisturising blend of Pro-Vitamin B5 and natural Jojoba Oil, the weightless shampoo gently eliminates impurities, whilst Nettle imparts mirror-like shine from root to tip. Expect voluminous, luscious locks with enhanced texture and definition. E.N.